The triceps may not have the same cultural cache as their cousins on the other side of the humerus, but in the strength world, they’re just as important! Whether you’re a bodybuilder or just someone looking to get stronger in your presses, it’s worth your time to add some size to the back of your arms. 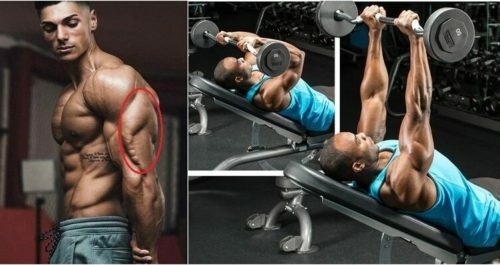 You can put together a hundred different triceps routines but I’ve done the work for you here with six straightforward and effective triceps workouts. Each is a bit different from the others based on your training experience and goals. Each one includes movements from the large family of triceps exercises—close-grip bench presses and dips, skullcrushers, press-downs, overhead extensions, and kick-backs—that focus on one or more of the three heads (lateral, long, and medial). Pick a routine you like, try it for 4-8 weeks wherever it makes sense in your split, then go back to your regular workout or try another from the list. Just because you’re training arms doesn’t mean your approach to building mass—like you do with, chest, legs, back, or shoulders—should change. Start with the most difficult moves with which you can push the heaviest weights. Don’t even think about looking toward the cable press-down station. As I’ve often said, multi joint exercises in which more than a single set of joints are at work allow you to use greater loads. With triceps, it’s a pretty short list, including dips (machine dips, bench dips, weighted parallel-bar dips) and close-grip bench presses. With the latter, if balance is too difficult, try it on the Smith machine. Besides starting with a multi joint exercise, there are a few other considerations when putting together your routine. Because the triceps’ long head (which sits just above the medial head) attaches above the shoulder joint as well as at the elbow, you’ll need to raise your upper arms completely overhead to fully recruit it into the motion. A muscle that isn’t fully stretched isn’t capable of contracting as strongly. For maximal long-head development, always include some kind of arms-overhead movement in your routine. Most arms-by-your-sides moves hit the outermost lateral head most strongly, so you’ll want to include one of those exercises as well. To better isolate the triceps and reduce the contribution from your deltoids and pecs, don’t allow your elbows to flare out during elbow-extension moves. This is true for all triceps exercises. Keep those elbows as tight to your sides as you can. Warm-up sets aren’t included; do as many as you need, but never take warm-ups to muscle failure. 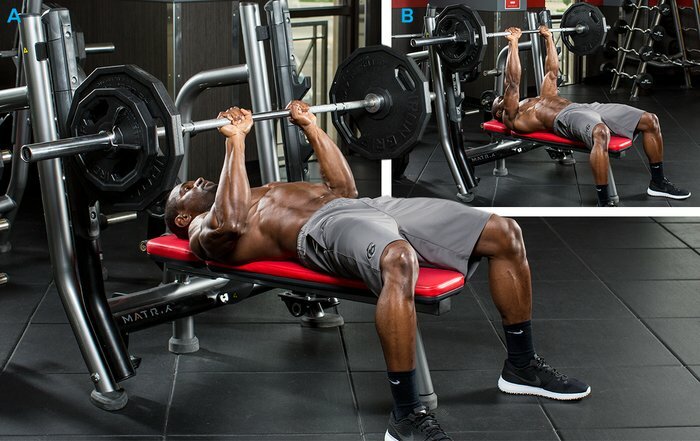 Go heavy on your first working set (first two sets of the first two exercises), and lighten the weight for slightly higher reps on successive sets. If you have a spotter, do a few forced reps on your heaviest sets, which are your first two sets. If you don’t have a partner, train as close to muscle failure as possible, and perform a drop set on your last set of each exercise. Simply doing light weights for high reps to build better arm definition is no longer considered the best approach. 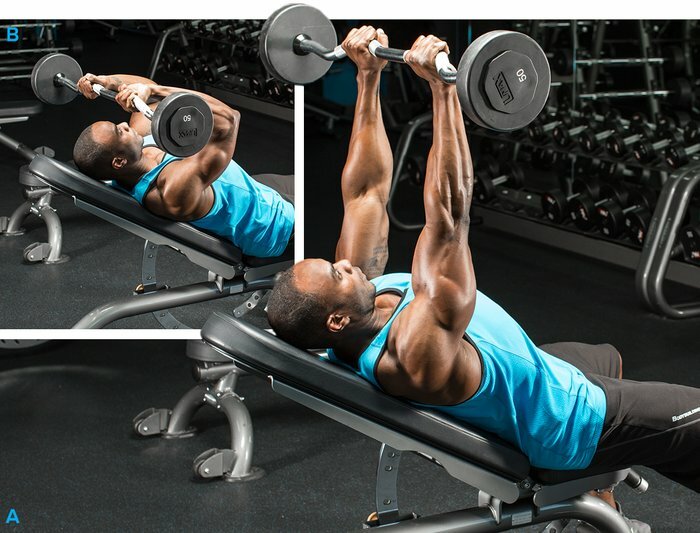 This workout starts with a straight-sets multi joint exercise for an initial size and strength stimulus, then picks up the pace by employing supersets with a high volume of work. You’ll be moving faster and really feeling the muscle burn. 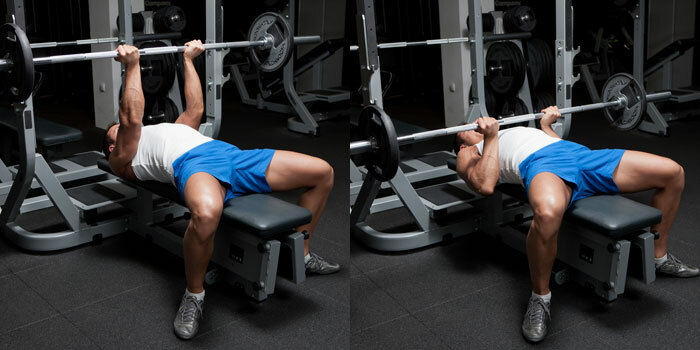 If you have a spotter, do a few forced reps on your heaviest sets of your initial exercise. If you don’t have a partner, train as close to muscle failure as possible. Perform a drop set on your last set of each exercise after you complete both moves, quickly reducing the weight by about 25 percent when you reach muscle failure and continuing on with the set to a second point of muscle failure. Beginners are encouraged to try different movements, to get a feel for the exercises and ensure they’re working all three triceps heads. I recommend starting with machines to rehearse the basic motions before graduating to free weights. Just make sure you adjust the machine for your body’s dimensions. Beginners are encouraged to try different movements, to get a feel for the exercises and ensure they’re working all three triceps heads. Though jumping over to free weights will prove to be a challenge for your coordination, they’re better for building muscle in the long term. Start light to focus on proper form first, adding weight only when you can fully control the motion. The largest head of the three, the lateral is also the one away from your mid line, so that makes it the outermost on your arm. Focusing on the lateral head is a great way to bring variety to your workout or target it if it’s particularly lagging. You can hit it with multi joint or single-joint movements, but the ones in which your arms stay by your sides work best, particularly with an overhand grip. If you have a spotter, do a few forced reps on your heaviest set(s) of the first two exercises. If you don’t have a partner, train as close to muscle failure as possible, and perform a dropset on your last set of each exercise. Note: Keep your body as upright as possible—don’t lean forward. Also, try to keep your elbows from flaring out as you do the move. On the opposite side of the horseshoe, just above the medial head, is the bulky long head. As stated earlier, because of how it attaches above the shoulder joint, you need to put your arms in the overhead position to best engage it. This workout makes a good change of pace from your usual triceps routine, but can also be done short term to bring up the long head. If you have a spotter, do a few forced reps on your heaviest set(s) of the first two exercises. If you don’t have a partner, train as close to muscle failure as possible, and perform a drop set on your last set of each exercise. The medial head stabilises the elbow joint and contributes to elbow extension. It’s relatively small compared to the long and lateral heads, and is almost impossible to work by itself in a workout. 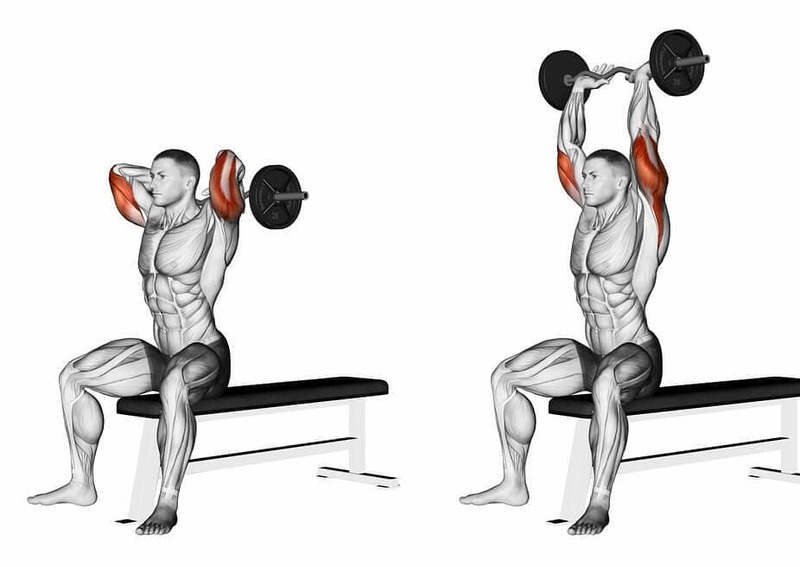 While just about every triceps move works it to some degree, this routine will provide more direct stimulation. Do the single-joint exercises last, as you won’t be able to use much resistance.